Following the pattern laid down 3 years earlier in Them!, The Deadly Mantis starts with a series of bizarre disappearances in a remote area. In this case, the Arctic and a military outpost stand in for the desert. When Colonel Joe Parkman (Craig Stevens) discovers a large spur-like object at the scene of a wrecked out-building, he calls in the big guns to help identify it. 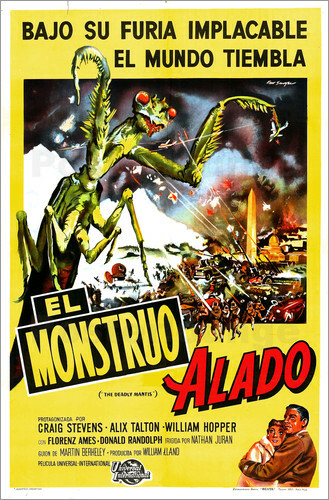 Dr. Nedrick Jackson (William Hopper), a paleontologist at the Museum of Natural History in Washington, D.C. decides the spur comes from an insect and since crickets and grasshoppers seldom eat the military, he blames the carnage on the meanest, most viciously Machiavellian insect in all of insectdom, the praying mantis. Cue Da dum music. Since they asked Jackson to identify the culprit, and he did, naturally they’d want him to come up to the Arctic and, um…well I don’t know. 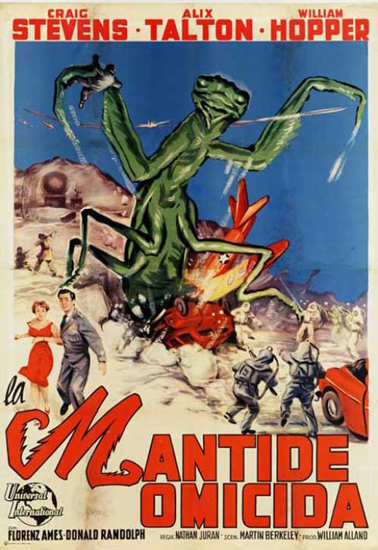 Using the same principle that has CSI operatives in movies carrying guns and arresting bad guys, The Deadly Mantis has the military flying Dr. Jackson up to the Arctic and bringing his pal, photographer Marge Blaine (Alix Talton) with him. Now we have the plucky and attractive career gal to complete our tableau. Marge and Colonel Parkman fall in love instantly or to paraphrase Woody Allen; Parkman falls in love. Marge just stands there. The mantis kills more guys in pretty horrific ways. The close-ups of his bearing down on each victim look really scary and the effects work well. Then our devout green friend does something incredibly cool. He flies. 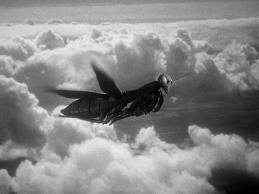 The mantis’ wings do a kind of hummingbird/helicopter thing and he sits upright as if he were riding dressage style. I tip my hat to my friend, Kent for suggesting the dressage idea. Dr. Jackson figures the mantis will fly due south and wind up in South America so I was confused when the film showed headlines sighting the creature in Maine, then New Orleans, and then Minnesota. Either the sightings involved a different gigantic flying insect or the mantis wanted to drop in on Garrison Keillor. 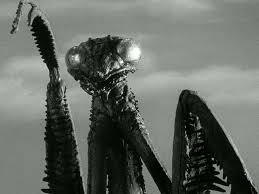 Anyway, our gang of intrepid mantis-hunters heads to Washington and since they had such a good thing going up north, the bug decides to follow them. There are some cool scenes of destruction and mayhem in our nation’s capital and a particularly fun Washington Monument shot. Eventually our bug-eyed friend winds up in a tunnel in New Jersey (note the Them! parallels) and since there’s no Deadly Mantis 2: Saying Grace in Trenton, you can kind of figure what happens. 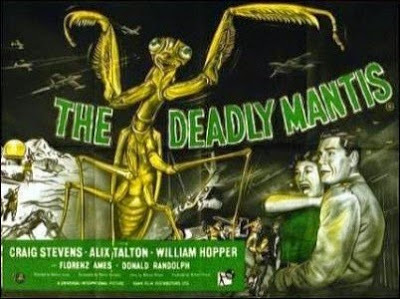 I enjoyed The Deadly Mantis. While not as good as Tarantula or Them!, it boasts a good cast of capable character actors (Peter Gunn AND Paul Drake!) and solid direction by Nathan Juran (The Brain from Planet Arous, Lost In Space and The Time Tunnel TV episodes) which took advantage of some fun special effects and blended real and stock footage well. 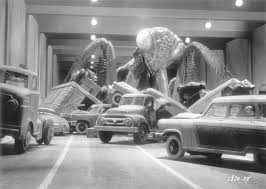 Fred Knoth did the special effects on this film and The Incredible Shrinking Man. 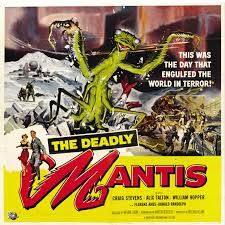 Creature from the Black Lagoon writer William Alland added his polish too making The Deadly Mantis a great way to spend 79 minutes. I went a little crazy with the posters again but, come on! It’s a giant praying mantis attacking a city! I think we need to see as many pictures of that as is humanly possible. You’re welcome. It is a surprisingly decent flick. At the same time, there’s also plenty of classic 1950s B movie cheesiness. I ended up rather liking this one. It’s one of my favorites in the genre. It’s pretty fun and not bad at all. I agree. Thank you for reading! Thank you! Your comment went to spam so I just saw it. I appreciate your taking the time to comment. Thank you so much! Unfortunately, this went to spam. I appreciate your taking the time to comment!